Parallels Desktop for Mac gives Apple users the ability to run Windows, Linux, or any other PC-based operating system at the same time as macOS. 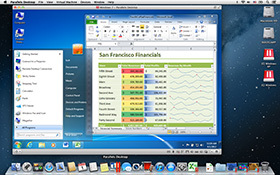 Unlike Apple's Boot Camp, where users must completely shut down OS X and endure a full OS start-up cycle to access an important application, Parallels empowers users with the ability to run Windows programs such as Outlook, Access, Internet Explorer and any other PC application without having to give up the usability and functionality of their Mac system, even for a few minutes. Why is Parallels Desktop the best solution for running Windows on a Mac? Parallels Desktop for Mac is easy to download, install and use. Build a virtual machine in seconds using helpful wizards. Configure virtual machines using a simple, web-inspired interface. Use virtually any version of Windows (3.11, 95, 98, ME, NT, 2000, XP, Vista, 7, 8, 10), Linux distribution, FreeBSD, Solaris, OS/2, eComStation, or MS-DOS in secure environments running alongside, not instead of OS X. With three different modes of running Windows: Full Screen, Single Window (pictured above) and Coherence, you can choose the best way to work. Use applications, access the internet, and work with any piece of hardware just like you would on a real PC, without the hassle of shutting down and booting up Windows, or switching between terminals. Create as many 'virtual machines' as you like, each with a different version of Windows. Perfect for developers and web designers to test their product in every type of operating system, without the expense of buying multiple PC's. Using the Parallels Shared Folder tool, you can easily share documents, folders, or your entire home folder contents between your Windows virtual machine, or simply copy and paste data the two systems. No networking or complicated set up required. Parallels Desktop includes the ability to import an existing Windows Boot Camp installation, saving you the time and effort of re-installing not only your Windows OS, but also all the other programs and customisations you've made. To have Windows with Parallels Desktop set up for you in your home or office, make a booking with one of our skilled on-site technicians.